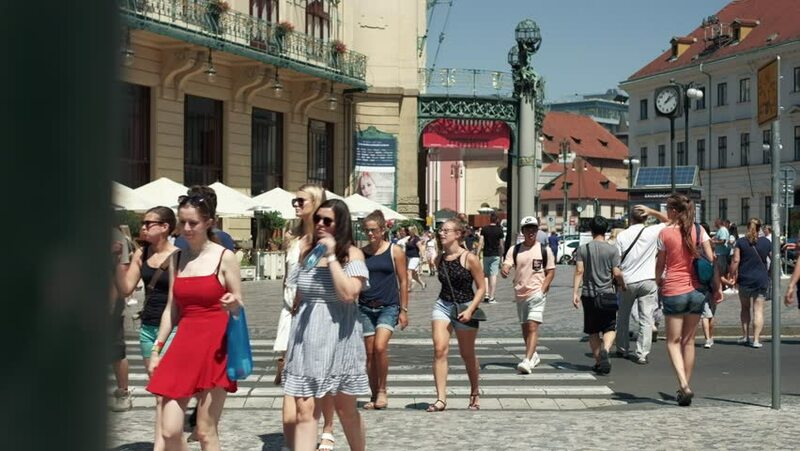 Prague, Czech Republic - August 2018: Old Town street view with people on crosswalk in front of Municipal House. 4K resolution trucking shot. hd01:00MADRID, SPAIN - MARCH 25, 2018: The celebrations of Holy Week in Madrid, began at the Cathedral of La Almudena with the solemn Mass of the Palm Trees. Slow motion. 4k00:08Asiago, Vicenza - Italy - April 25 2018: People walking in the center of Asiago, Italy. hd00:13ANGERS FRANCE - JULY 2014: Pedestrian shopping street called Lenepveu Street - One of the many streets closed off to traffic and lined with shops and restaurants in the heart of the city. hd00:20FLORENCE, ITALY - July 18: Tourists visiting Palazzo Vecchio in Florence on July 18, 2012. Palazzo Vecchio is a World Heritage Site in Tuscany. hd00:22ATHENS, GREECE - CIRCA JULY, 2015: Tourist walk at Plaka neighborhood, on July 2015, in Athens, Greece.